Incredibly, it’s been over 30 years since our last visit to Dubrovnik as students exploring the coast of what was then Yugoslavia in an old VW beetle. 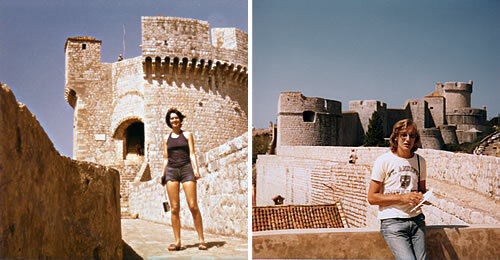 Not much seems to have changed as we arrive at the Pile Gate, and head into the walled city. But of course, much has changed for the residents during that time. A war has raged, buildings damaged and some locals moved out, unable to afford the cost of repair. There’s a map at the Buža Gate which details the damage, and shows how resilient the Dubrovnik people are. On a peaceful September evening, it all seems very far away. We’re staying in the romantically named Rooms Lavender & Rosemary tucked in close to the Minčeta tower, the highest part of the old town. Which means, of course, a long trek up several flights of steps with our bags. When we get there, breathing heavily, our host is friendly, the room is lovely, and the views extraordinary! Given the steps, we choose to eat at the nearby Lady Pi Pi restaurant. It’s popular, and we have to wait in line for a table. 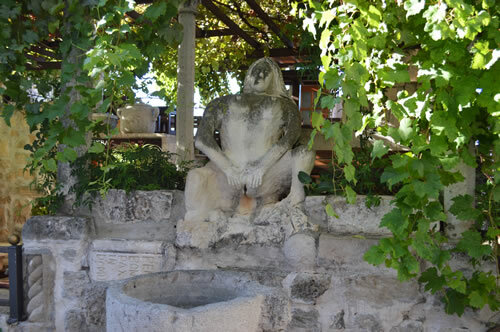 In the meantime, we admire the statue of the lady herself, apparently an antique fountain. Hmmmm, that’s different! 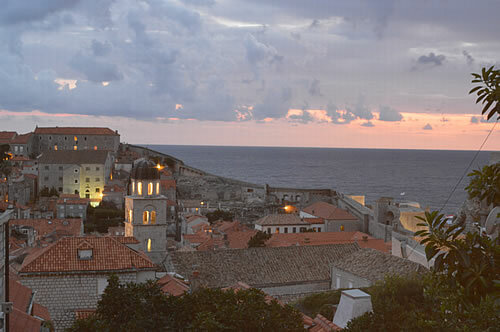 So is the restaurant itself, a warren of small terraces and levels, with an open grill in the Dalmatian style. The food is tasty and the view over the city roofs is fascinating, though I’m glad of the fleecy blanket provided for guests as the darkness settles in. The next day dawns bright and sunny. 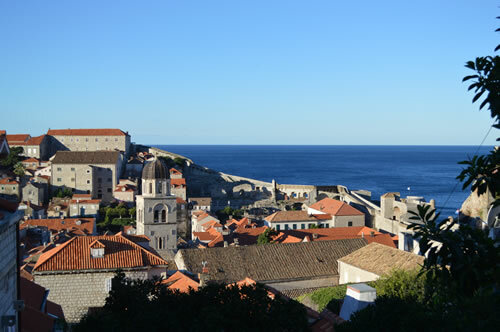 We have a glorious view of stone walls, terracotta roofs and cobalt blue sea from our bathroom! 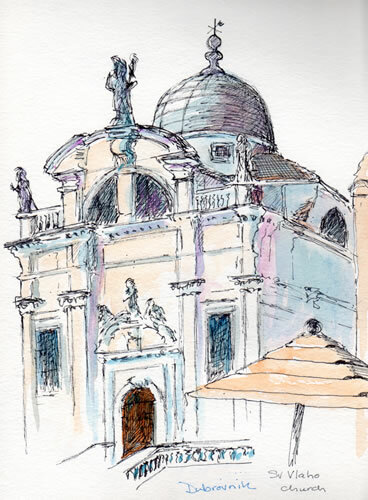 We head down towards Stradun to find breakfast, choosing the cafe opposite the church of Sv Vlaho which I settle down to sketch. Every so often, it’s as if the floodgates are opened, and a mass of tourists flows up Stradun and mills around in front of us. This is where sketching beats out photography as I can leave them out of my picture! We meet up with our friends and plan the day. I want to visit the modern art gallery, as I know this area has produced some wonderful artists. We’ll leave the walk around the city walls for later in the afternoon, once the cruisers have departed back to their ships. We start with a small detour by the farmers’ market, and up to the rather peaceful square by the cathedral. This is where our friends are staying, an apartment in a converted palace with a lovely shady private garden. What a wonderful retreat from the busy streets of the city! From there we wend our way down to the marina. 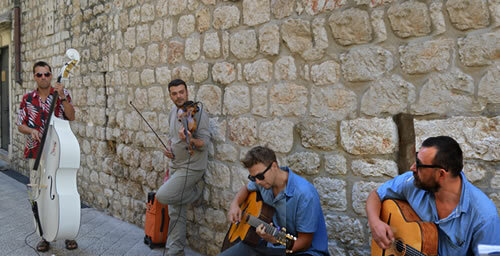 On the way we find a group of gypsy jazz musicians – they’re really good and we linger to enjoy for a while. I’m very taken with the double bass player in his Hawaiian shirt and red-checked sun glasses – what a brilliant subject for a painting! Our progress is further slowed by the small artisan galleries on the route. There’s a stone sculptor’s studio, and a gallery of work by local artists. Downstairs is full of local crafts and produce, while upstairs the walls are covered in paintings. 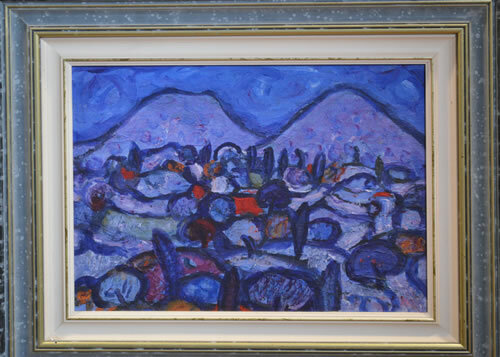 I find a small blue-violet landscape really beautiful and evocative of a moonlit night in Dalmatia – who is the artist? Yes, well that would be a Đuro Pulitika, wouldn’t it? One of Croatia’s best artists of recent times and clearly one whose work I need to explore. We head out of the old town past the enormous Revelin. I’m impressed by its sheer size compared to Vrboska’s rather more modest version on the front of St Mary’s church. A ravelin, if you remember your medieval defensive fortifications, is a pointed construction jutting out of the wall to protect the entrance. 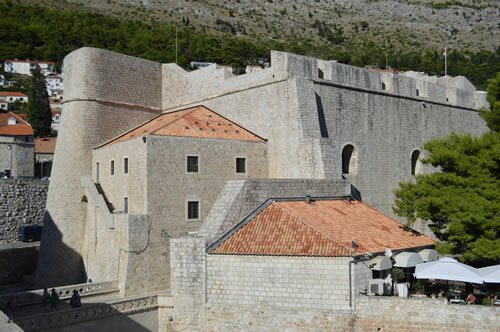 In Dubrovnik’s case, it protects the harbour, as well as the Ploče entry gate. The walk out to the art gallery provides some fantastic views back to the old town. In fact the best view is from the terrace there. 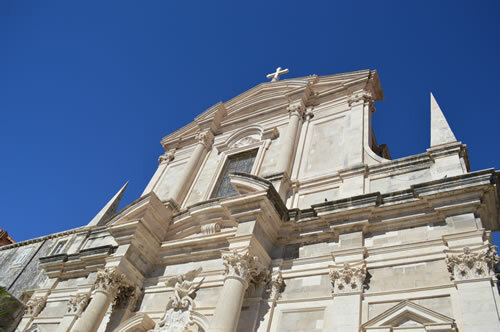 It’s the classic sight of Dubrovnik set within its curving protective walls against the clear blue of the sea. Glorious! The terrace of the modern gallery has a permanent display of sculptures and temporary scenery from a summer festival performance. What a wonderful venue! I spend time sketching some of the sculptures in my book, then we go inside. And that’s where I discover that the Dubrovnik Modern Gallery doesn’t have its permanent collection on display at all times. What?! Now I appreciate seeing work by contemporary artists, but really, 3 floors of black plastic bags and balls of yarn when this area has such a rich history in painting? I was gutted. On the way back towards town, we thought to get a cold drink. Handily, there was a sign for a restaurant down some steps to the waterfront. That turned out to be a good decision, as the Komarda’s quiet terrace under the trees provided a wonderful view of Dubrovnik harbour. We opted to stay for lunch, enjoying the atmosphere and chatting with the friendly staff. 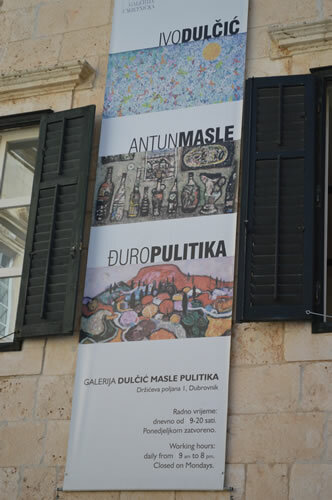 After lunch, we visited the Ivo Dulčić – Antun Masle – Duro Pulitika gallery where we manage to catch sight of a few works by each artist. Sadly, rather few, since the upper floor of the gallery is currently closed for renovation. Typical! However, I do enjoy seeing another Đuro Pulitika landscape up close and personal, and discover the existence of his art studio nearby. Next time I’ll start there! After our tour, it’s wonderful to sit down, have a glass of wine and watch the sunset. 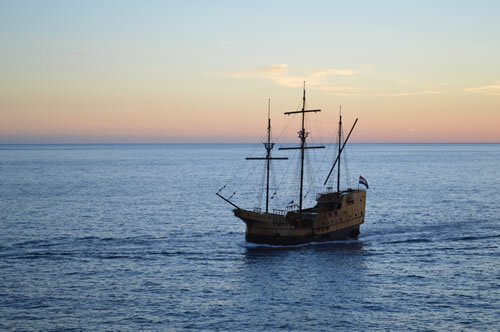 A replica of an old Dubrovnik trading galleon sails past, completing the picture! For dinner, we went to the Restaurant Kopun near the cathedral, which specializes in traditional Croatian cuisine, very fresh and tasty. Great wine selection – and they had some wonderful art on the walls, too. What more could you want? What a perfect end to a lovely day! Marion, you write beautifully and this is a perfect description of our day. I love the 1977 photos. You two were adorable and you still are! Thanks, Mary! We really enjoyed having your company, that was fun!